body surmounted by a lotus bud-form upper lobe, producing a gourd form. A thick grooved handle is attached opposite the slightly tapered faceted spout. The vessel is covered overall with a matt glaze of khaki-green color ending above the flat unglazed base where the extremely refined ware burned a buff color in firing. 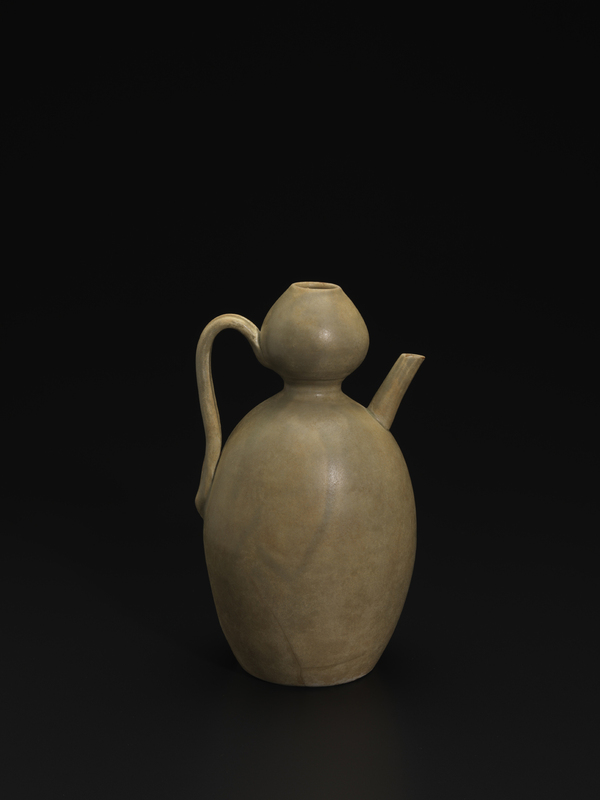 The gourd shape, which was produced in ceramics in China already during the Neolithic era, remained a relatively rare form until the wares of the late Tang dynasty and especially in later Chinese wares of the Yuan, Ming and Qing dynasties when the gourd became a very popular form. Not only was the shape of the gourd itself intriguing but its symbolic value associated with the Daoist quest for immortality was also of great import. The production of gourd-shaped vessels at kilns throughout China provided a steady supply of equipment necessary for potential immortals and also attractive and functional vessels for those of lesser aspirations. Yue ware had achieved its second period of fluorescence during the later Tang when the ware was extolled by tea enthusiasts and poets alike. The inventions and creations of the Yue potters laid the foundation upon which the great celadons of the Song dynasty developed, with their numerous local and divergent styles in shape, glaze, and décor. Yet one is still easily captivated by the purity of the Tang wares, with no surface décor to interrupt the effect of graceful forms and lovely glazes. Tang Yue thus joined with the Tang white wares of Xing to establish purity, simplicity and grace as the hallmarks of a great ceramic.